A senator from Connecticut is raising big questions about America’s unwavering support for Saudi Arabia. 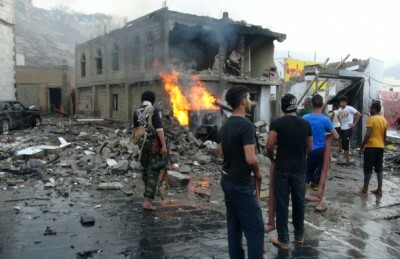 His comments come as the Saudis and their Arab allies begin a second year at war in Yemen. Fighting there in the past year has killed more than 3,000 civilians, many with US-made weapons. Saudi Arabia buys more US weapons than any nation in the world. US support does not end at weapons sales. The United States military advises the Saudi-led coalition as it conducts its air war in Yemen. Connecticut Democrat Chris Murphy, a member of the Senate Foreign Relations Committee, asks why the US has stood by while the Saudi-led coalition of Arab air forces has pounded Yemen daily since March 26, 2015. “It’s hard for me to figure out what the US national security interests are inside the civil war in Yemen,” says Senator Murphy. Fighting in Yemen involves local militias, separatist groups, a Saudi-backed political elite and a well-organized rebel force, known as the Houthis, which seized control of the country in early 2015. While the politics of the Yemen war are murky, the toll on Yemeni civilians is clear. It’s hard for me to figure out what the US national security interests are inside the civil war in Yemen,” says Senator Murphy. On Tuesday, March 15, jet fighters from the Saudi-led coalition struck a crowded marketplace at midday in Khamis, a village north of the Yemeni capital, Sanaa. Doctors Without Borders/Médecins Sans Frontières reports “Khamis was full of people who had gathered for the weekly market day. Dozens of civilians were present at the time of the airstrike, including women, children and the elderly, and many were injured or killed in the attack.” There are no military targets in Khamis. The chaos of war has opened opportunities for Al Qaeda in the Arabian Peninsula and ISIS to expand their areas of control and strike targets without being challenged by either the Yemeni Houthis or the Saudis, who remain focused on fighting each other. Senator Murphy thinks US support for the Saudi campaign, which includes targeting assistance and mid-air refueling of fighter jets, is undercutting America’s true objectives in Yemen, to reduce the threat of AQAP, which has launched several failed attacks on mainland US targets. In the past year alone, the United States has agreed to resupply Saudi Arabia with $1.29 billion in bombs that have been expended in daily airstrikes on Yemen. Senator Murphy wants to examine such deals, and place conditions on the sale of weapons to hold the Saudis accountable. What kind of conditions? Yemenis have been calling on the US, since the beginning of the war, to reign in the Saudis. In recent months, activists have openly blamed the US for the unrelenting air strikes. But it’s not easy to explain the Yemen story to Murphy’s Connecticut constituents. Among Murphy’s constituents are two big arms makers who do business with Saudi Arabia: Pratt & Whitney, which makes and maintains jet engines, and Sikorsky which produces the Blackhawk helicopter. Senator Murphy says he must balance the interests of everyone in his state.